If you plan to be in London on November 15, stop by the Waterstones on Tottenham Court road at 6:30pm for the launch of a new Beatles book called "Visualising the Beatles." There will be live music and the book looks interesting. The BBFC will be reviewing it in our next quarterly magazine, but if you are looking for ideas for Christmas gifts, you might want to go along and check it out in person since our review won't be published until January. The publisher describes the the book as "... the story of the Beatles told as never before. 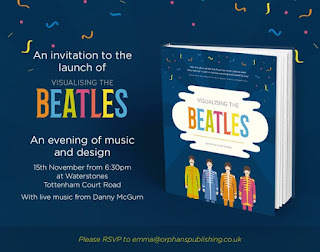 Explored visually, through stunning infographics and data visualisations, this book takes you on a vibrant ride through the Beatles years - from their first Cavern Club gig to the release of Let It Be.Presenting unique, witty and surprising facts and stories, covering everything from their style to plans for a Beatles Island, VISUALISING THE BEATLES charts how four young men evolved into one of the world's greatest bands. It includes beautiful visuals created from the data their music left behind, divided by album, to allow you to spot, in an instant, the patterns, anomalies and changes in the band's lyrics, instruments, songwriting and performances." The launch is November 15, but the book will be available for sale on November 3. The St Thomas Lupus trust is auctioning a special one-off signed print of the Beatles by Cynthia Lennon. The original painting of the Beatles was inspired by the song 'Your mother should know' when it appeared in the film the Magical Mystery Tour, written by Paul McCartney. In the film the Beatles, wearing white tuxedos, come down a grand staircase followed by boy scouts. Cynthia kindly gave permission for the image to be used to raise funds for the St Thomas Lupus Trust. The trust has produced Beatles notelets, still available in their online shop. The charity is linked to the Beatles through the song 'Lucy in the Sky with Diamonds'. Fans around the world know about how Julian Lennon had a childhood friend, Lucy Vodden and drew a picture of her. His father, John Lennon, saw the picture and it led to him writing the now iconic song. When Lucy lost her battle with lupus in 2009 aged just 46, she was a staunch supporter of the St Thomas Lupus Trust. This very special auction will end on 31st October which marks the last day of Lupus Awareness month in the UK. 100% of money raised at the auctions goes directly to support the charity. View and bid on the signed print by visiting the Ebay auction site. Dublin is coming up Beatles for November! THE BEATLE MONOLOGUES at Briody’s on Marlborough Street. As part of the show there will be Beatle songs performed live by Jonny Ward and Duncan Maitland. BBFC Magazine Issue 60 Out Now! Hot off the presses, issue 60 of our quarterly magazine is out now. If you are a member, it is in the post. Non members can order a copy from our website here. Deadline is next weekend. Send in your photos! We've had a nice lot of photos submitted but not enough to make the calendar happen. One week left. The calendar can't happen without more photos. The British Beatles Fan Club is cooking up a new project for our members and it will only work with your help. It has been a big year for Beatles events. 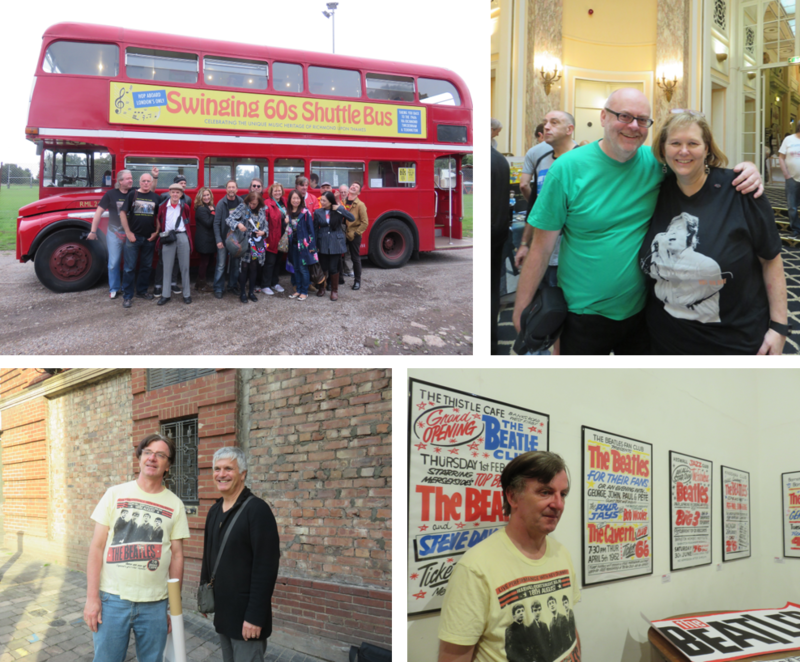 Not only have Paul and Ringo both been touring but many of our members have attended festivals, tribute concerts, stage productions and film premieres all over the world. We know you took pictures of you and your friends throughout the year and we thought it would be a fab idea to gather these photos together into a BBFC calendar for 2017. Part 1: We need to collect enough photos. So start sending them in today. Email them to website@britishbeatlesfanclub.co.uk with the title "Calendar Photos". Part 2: Assuming we receive enough photo contributions, we will advertise for calendar pre-orders. We will need a minimum number of orders to keep the price down and if we get enough pre-orders, we will produce the calendar filled with your photos of you and your fellow BBFC members.